The impact of this breakthrough opened myriad possibilities for stem cell research and continues to propel the field forward; both men will be addressing the ISSCR annual meeting, 26-29 June, in Los Angeles, Calif. In the 1960s, the early days of stem cell research, John Gurdon was a student in the U.K. when he began working on cloning — transplanting the nucleus from the cell of one organism into the egg of another where the nucleus had been removed. His experiments demonstrated that a mature cell, one that was fully differentiated, could revert to an earlier state when introduced into a developing egg, in this case a frog tadpole. Gurdon’s work provided a fundamental paradigm shift for developmental biologists: an adult cell, in an already differentiated state, was not permanently stuck in that state as had been previously thought. In fact, in the right environment, adult cells could revert to an earlier, embryonic cell type that would be capable of giving rise to all the specialized cell types present in an adult organism. With that new understanding, researchers began working to answer key biological questions that surfaced from those early experiments: what genetic, biological, or chemical components were responsible for encouraging cells to go back to an earlier state and regain the potential to become any cell type? What minimal factors would be sufficient to readily reprogram cells? How could reprogramming events be harnessed to better understand human development in health and disease? It wasn’t until more than 40 years after Gurdon’s work that Shinya Yamanaka and his colleagues in Japan identified the key genes that control this “reprogramming” of adult cells. Yamanaka was able to induce adult mouse cells to a pluripotent state whereby the cells mimicked embryonic stem cells and could become any cell type in the body. These cells are known as ‘induced pluripotent stem’ (iPS) cells. Soon, Yamanaka and another scientist, James Thomson in the U.S., published studies showing that human cells could be similarly reprogrammed back to a pluripotent state. Yamanaka and his team identified just four genes that, if expressed in adult skin cells, could convert mature cells back into pluripotent stem cells that could become any cell in the body. Collectively, the research by Gurdon and Yamanaka ushered in a new era that changed the face of stem cell research. Precision Medicine: iPS cells have shown promise as a tool in predicting how particular patients will respond to potential therapies. By developing iPS cells from patients or patient groups, researchers can test those cells with potential drugs to develop customized treatments to optimize individual patient outcomes. 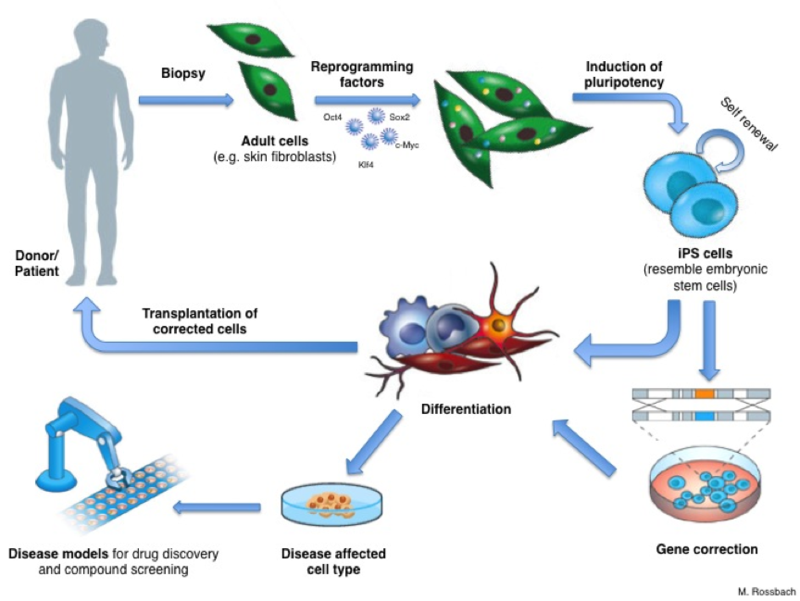 Disease Modelling & Drug Discovery: Outside of the body, patient-generated iPS cells retain the same genetic and/or cellular defects they do in the patient. These cells can be analyzed in labs to uncover the underlying mechanisms of the disease, including the identification of new genetic and environmental causes. These “diseases in a dish” can also be used screen thousands of chemical compounds to discover new drugs that could potentially treat disease-affected cells. Cell Therapies: iPS cells could potentially be used to generate cell types that could be transplanted to replace those lost or damaged in organs or tissues due to injury or disease. Because they are the patient’s own cells, they escape immune rejection that remains a serious concern for current organ transplants from donors. For example, experimental iPS cell therapies are being investigated that may one day replace neurons in Parkinson’s Disease patient brains, different cell types of the eye for degenerative eye conditions, heart cells for heart disease, and more. The process of moving a scientific discovery into an actual treatment available for patients takes many years, even decades, and there is currently no medical treatment that directly involves iPS cells, though many are being developed and some are in clinical trial. In the meantime, scientists are looking to answer questions about how to standardize iPS cell lines to reduce variability of outcomes, determine how to make iPS cells uniform for any given use, and ensure their safety and efficacy before using the cells as potential treatments.